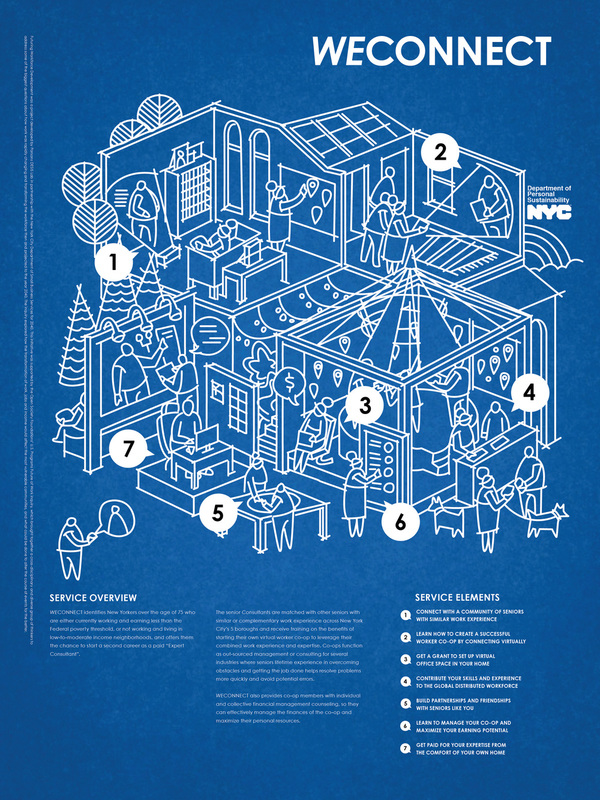 Imagining new types of workforce development services that could benefit New Yorkers in the year 2040. Workshop toolkit to help participants imagine the future of employment services. As a part of Open Society Foundation's 2014 Future of Work inquiry, Parsons DESIS Lab partnered with New York City Department of Small Business Services to explore the future of workforce development in New York City. Designers and futurists collaborated with staff from SBS to imagine new types of workforce development services for the year 2040. In “discovery” phase, in which DESIS Lab researched various forces and developments potentially shaping the future of work; followed by a “co-design” phase, in which a large group of SBS staff participated in a workshop to design workforce development services for different future scenarios; and concluding with a “synthesis” phase, in which the resulting future-service concepts were refined and visualized for further consideration. The goal of the project was not to predict the future, or to propose a singular vision or policy direction, but rather to explore the implications of multiple potential futures, and to generate new ideas about workforce development in the present. Iterations of workshop design process in collaboration with the staff of partner organisation SBS. A participant using the futuring stencil to visualize the scenario the team generated. Three main Workforce Connect scenarios were emerged from the workshop outcomes. These concepts focus on training and pairing qualified candidates with employers, brokering peer-to-peer connections, and proposing technology for more accurate and personalized solutions. Workforce Connect posters are illustrated by incredibly talented Amy Fiendeiss.